Many water scenes are depicted in Ukiyo-e where a water surface and splash, rain drops, and many other waters are expressed very lively. For example, "The Tamagawa in Musashi Province" by Hokuusai shows very beautiful expression of water surface and "Bridge Ohashi and Atake in Sudden Shower" by Hiroshige is well known as the master piece of rain expression. 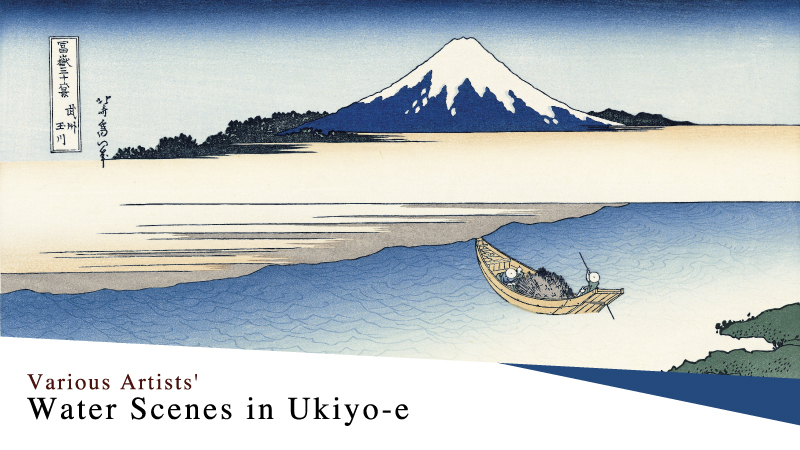 Please take a closer look at the water expression in each Ukiyo-e futured in this special "Water Scenes" event! The special featured print of this "Water Scenes" event is "View of Tokyo's Shin-Ohashi bridge in Rain" by Kiyochika Kobayashi (1847-1915) known as an artist who well used the effect of lights and shadows in his works. This Ukiyo-e is offered with a special price, 13,000yen (regular price: 20,000yen) only for a limited time till June 24th. Please do not miss it! * The prices are shown as excluded tax.